Before we talk about the next crypto wave, let us reflect on the previous one – what was life like back then. We might as well tell you that, things change extremely fast in the crypto world. So the term ‘way back’ could imply a time span of just 4 to 6 months. The last crypto wave was all about BITCOIN (BTC), it came and it conquered and it made a record number of millionaires. There was a time when BTC was quoted well above, $16,000. Crypto was BTC and BTC was crypto, millions of dreamers started following the crypto coin. The coin started losing its value but, the dreams went on and on. BITCOIN seemed to have found a comfortable zone in the $6,000 to $8,000 price range. BTC maintained this price level until the third quarter of 2018, what followed is something that, even the most seasoned crypto analyst would love to forget. BTC crashed to a paltry $3,700 in November 2018, it remained well below $5,000 as it went into 2019. Crypto markets dropped into a bearish mood and both, BTC and ETH recorded significant losses. The over dependence of markets on a handful of cryptos, proved to be extremely risky. 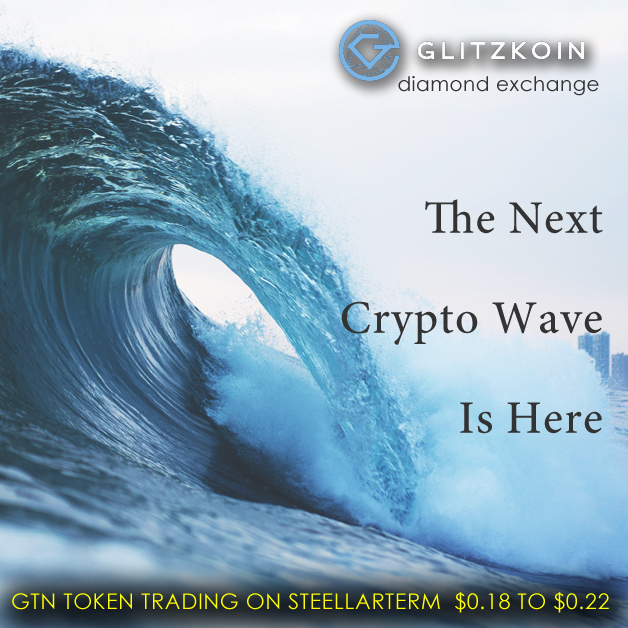 While the wait for the next crypto wave goes on, we at GLITZKOIN are of the opinion that, it is already here. The new wave is different, a lot less noisy, more diligent and bestowed with a high degree of common sense and purpose. Crypto world participants, are taking a close look at projects being launched. Let us tell you what else is new. Interest in blockchain projects that, offer little more than a crypto token is at an all time low. No one except debutant amateurs are dreaming of overnight success, seasoned crypto participants are willing to wait it out. Markets are starting to rebuild – based on substance and not reckless speculation. A group of enterprising crypto buyers and blockchain promoters have set their minds on charting a new course. The encouraging news is that, the new mindset is catching up fast and this bodes well for the industry. Glitzkoin leads the new breed of blockchain projects that, are focused on making a positive impact on real world business. Unlike most projects that have taken shape from technical minds, the Glitzkoin project has been conceptualized by a second generation diamond expert – Navneet Goenka. The powerful features of blockchain and crypto, have been mapped against the inefficiencies and weak areas of the $90 billion diamond industry. The project includes a comprehensive diamond trading platform - DiaEx. Supporting both B2B and B2C transactions, DiaEx allows diamond traders of all sizes and located at any point on the globe, to interact directly with the platform. The GTN token which is a part of the project, has been deployed to reduce dependence on the conventional banking system. Transactions conducted on DiaEx will be settled using the Glitzkoin GTN token. Diamond trade has always, been hampered by cumbersome banking procedures and substantial banking charges. The emergence of digital currencies, holds promise for the trade. Using a crypto to make payment on DiaEx, eliminates the complications that multiple currencies and their conversion generates. Glitzkoin promoters realize that, the best way to bridge the gap between, technology and the real world economy is to increase usage for the GTN crypto token. Ongoing discussions involving various businesses, focus on getting them to accept the GTN token as a mode of payment in their business operations. Announcements made in early 2019 confirm a partnership between online ticketing giant Myticket.asia and Glitzkoin. As per this arrangement, visitors to the online ticketing portal, can use the GTN token to pay for their purchases. Here is some constructive advice for those of you who plan to participate in the newly evolving crypto space. To begin with, review each project carefully, separate marketing hype from real substance. Set up a ‘basket’ of handpicked tokens, spread your purchase plans across cryptos and projects. Do not be over ambitious, try to understand that stability and consistency, take time to develop. The problem with maintaining too high expectations is that, you tend to overspend and indulge in high risk. There is no logic in the belief that high priced tokens are better than, tokens that are modestly priced. For tokens that have been around for around 8-12 months, evaluating the current price trend against the ICO closing price is a good beginning. Take the Glitzkoin GTN token as an example, the ICO was completed in June 2018 at a price of $0.20. The token at this time is trading on the Stellarport exchange, the price is in the $0.25 to $0.30 range. This adds up to an amazing 50% price appreciation, when compared to the GTN ICO closing price of $0.20. An impressive performance if you consider the fact that, most cryptos launched during this time have lost up to 70% of their ICO value. A quick comparison between BTC, ETH and GTN during the July 2018 to February 2019 period, reveals some amazing bits of information. While Bitcoin and ETH lost as much as 55% of their value, the affordably priced GTN token gained a chunky 50%. Proof that a high priced token need not always offer the best price potential is clear, when you review this comparison. So should you make a purchase during the ICO or wait for it to complete. This is a tossup and both timings have their set of loyal fans. It is generally noticed that, many ICO issues offer tokens at an attractive price. The downside is that, you never know how the project would perform after the ICO – an ICO is conducted at the very beginning of a project. Waiting for the ICO to complete and the project to make some headway, does allow you to stay away from projects that experience a price crash shortly after the ICO is completed and the token listed. The crypto market might be a bit quiet but, there is no reason to stay away. Keep your spending within limits and carefully evaluate your picks. There might be some truth in the saying that, marketing gets louder as the markets grow quieter. Learn to distinguish between true substance and sales hype.